Our international high school offers a unique opportunity in the region of Pavia, giving students an opportunity to obtain a passport for success in Italian and foreign universities. ISP international high school is a bilingual school that has been awarded the status of Paritaria School with ministerial decree no. 241 of 26-06-2012. 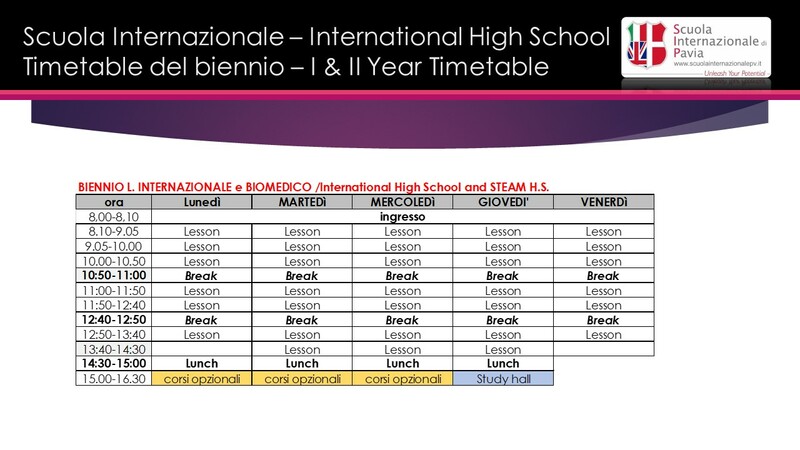 It follows a dual curriculum, Italian and International, enabling students to continue their university studies in other countries (for example England or the United States) by qualifying students to sit the International Certificate of General Education, and then further studies with AS & A Levels. The previous chart compares the hours of instruction in Italian compared to foreign languages. Teaching objectives relate to the international certification of curriculum languages studied, in addition to the optional German language. Other examinations concern the Cambridge curriculum and are related to subjects studied in English. Teaching objectives relate to the international certification of curriculum languages studied. Other examinations concern the Cambridge curriculum and are related to subjects studied in English. 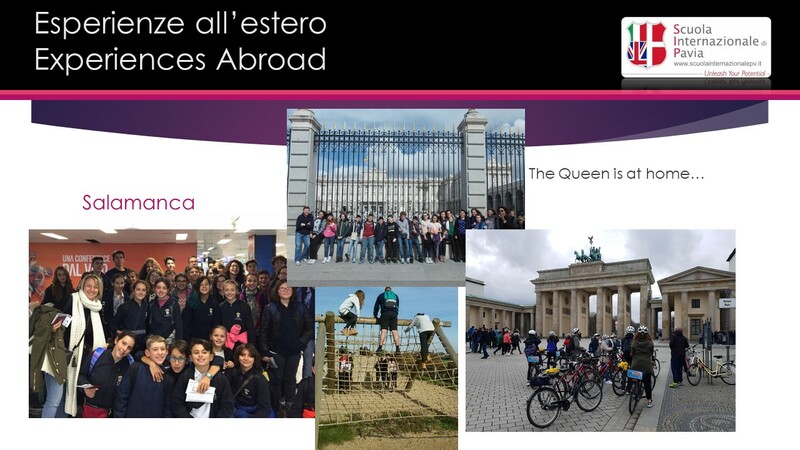 All curricular activities, carried out in a foreign language, are taught by qualified and native teachers in compliance with existing legislation governing schools. 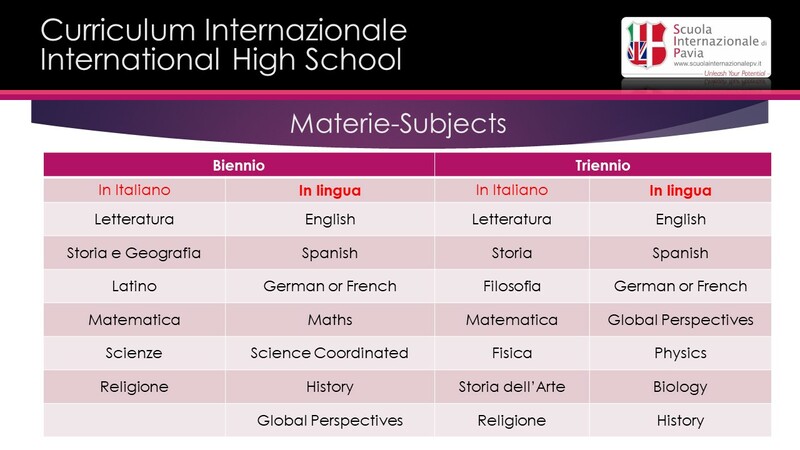 Other disciplines are enriched through this curriculum, and are strengthened through this setting: for example, the study of Italian is implemented in order to master the mother tongue both to ensure the appropriate expressive skills and to aid learning of foreign languages. Another example can be made for Latin, studied in the first two years, proving fundamental to consolidating grammatical, etymological skills and facilitating comparison between different languages by recognising the common Latin root (for Spanish) or highlighting structural differences (For English, German - which is similar to Latin for the use of declinations). The Social Interest course is aimed at helping students to reflect on the importance of the experiences and on how these are experienced differently by each individual. Meeting the other means accepting the diversity and only through active reflection and elaboration, is it possible to bring out the uniqueness of the individual as an integral part of the group. The Social Interest hour is also dedicated to acquiring a capacity for managing emotional processes, starting from the experiential data shared by the students themselves or by all that happens in modern times. The program is flexible as every year it is adjusted to the requirements and interests of each class. Recognising the emotions we feel, and knowing how to give them their proper name are important elements for a good structuring of the 'Self' and for developing empathic behaviour, the foundation for effective socialization. The Social Interest class starts in the first grade of secondary school and continues until the last year of high school. With an International School of Pavia diploma in languages you can access many university faculties. 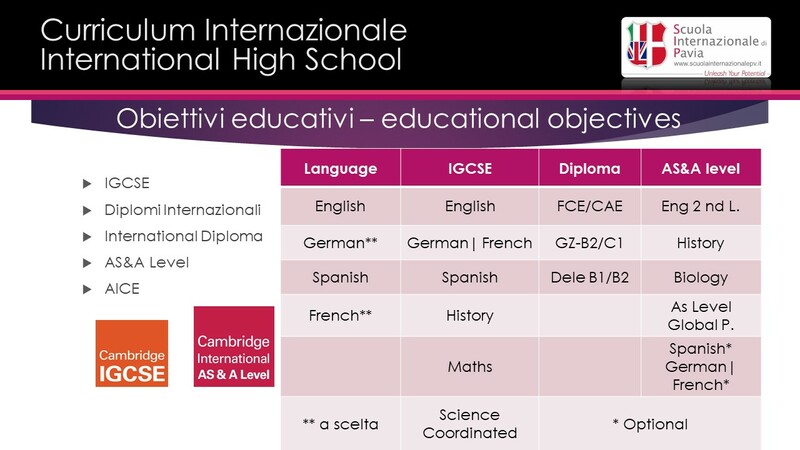 Thanks to the consolidation of subjects taught in English and aimed at attaining the IGCSE, AS & A Levels, the student completes a whole cultural path, as well as improving their mathematical and scientific skills directly in English. In this way, the students will have the right preparation to enrol themselves in any University courses in English.